An unassuming wood house at 20 Sumner Road, built in 1924, is now the site of a renovation that may provide a blueprint for concrete steps to bring sustainability to home renovation. Harvard’s Center for Green Buildings and Cities (CGBC) is an initiative of the Graduate School of Design focusing on sustainable development. Instead of following the traditional processes of construction, it focuses on developing new construction methods for existing structures that emphasize efficiency, sustainability, and lifetime performance. This summer, the CGBC started transforming its headquarters into “HouseZero,” a retrofitted building that aims to produce more energy than it consumes. Achieving multiple sustainability goals in a retrofit—including entirely natural lighting, ventilation, and zero emissions—could provide a repeatable checklist, the CGBC hopes, for similar retrofits of small-scale, residential buildings throughout the United States. A common standard for green construction has been developed by Leadership in Energy and Environmental Design (LEED), though that standard has been criticized for prioritizing reduced environmental costs over the health of the people using the building. Malkawi, however, says the CGBC is not seeking any kind of independent certification because they plan to exceed those standards’ criteria. A green building, he says, should be “a sustainable building, which means it has the lowest impact on its surrounding environment as possible. It might have a positive effect on its environment—the surrounding as well as the global.” He adds that it should be “healthy for its occupants” and encourage productivity and creativity. This approach, as well as the goals for being beyond net zero energy consumption with 100 percent natural light and ventilation, guides the renovation. The planned changes, shown here, will allow the house to be naturally lit and ventilated. 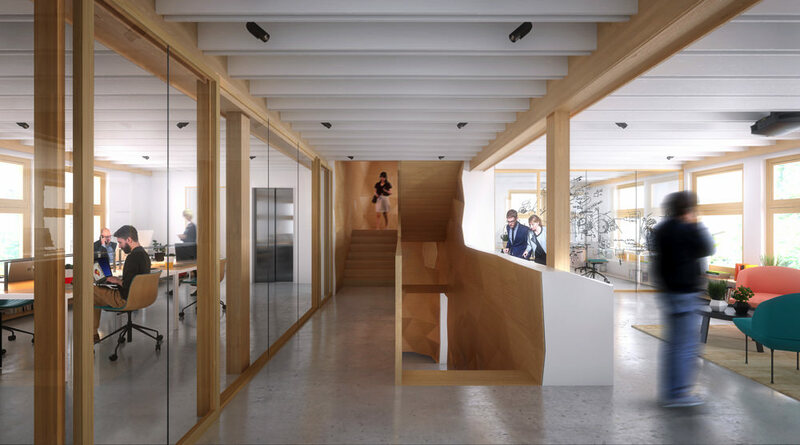 To reduce overall energy consumption, HouseZero is expected to regulate its own temperature and light. The windows will open and close automatically to adjust temperature and provide ventilation. Ventilation will also be created by convection when the sun shines on the house’s chimney, creating negative pressure at the top of the chimney: air will move up from the basement to compensate for that pressure difference. When the weather is uncomfortably hot or cold, the house will tap into the ground’s temperature, which is more stable. Water will be circulated under the house until it reaches ground temperature, which is warmer than the air during the winter, and cooler than the air during the summer, and that water will in turn heat or cool floor slabs. The CGBC is also adding concrete to the stairs and floors—thermal masses which will make the internal air temperature more resistant to change. In a press release, the CGBC said that “property owners spend more than $230 billion annually heating, cooling and powering [the nation’s] 113.6 million homes,” making up 40 percent of the country’s energy consumption. Green buildings can reduce that demand for energy, and also provide business benefits: retrofits like that being undertaken at the CGBC offices can reduce operating costs by 53 percent and energy consumption by 45 percent. Studies have also suggested they have health benefits, and can alleviate “asthma, respiratory allergies, depression, and stress.” Separately, Joseph Allen, assistant professor of exposure assessment science at the Harvard T.H. 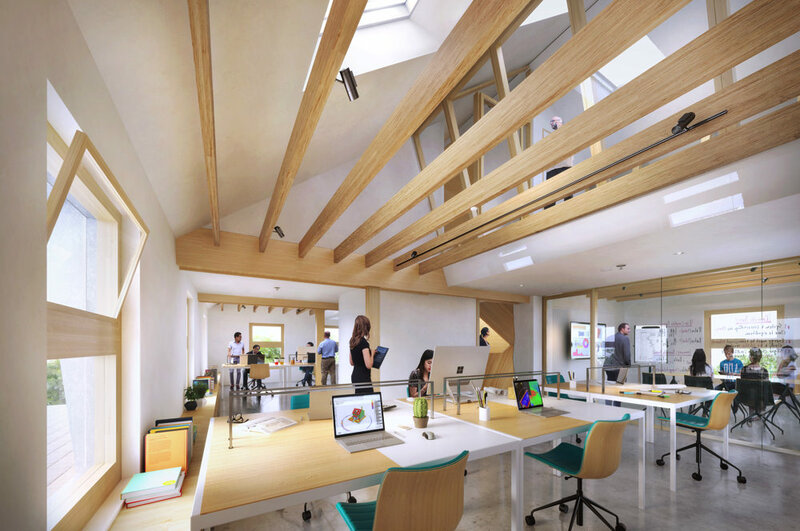 Chan School of Public Health, has found that taking steps to make buildings healthier for people can promote workplace productivity. The renovation is expected to be completed in December, and Malkawi says there are plans for a second phase to expand the building underground while maintaining its energy efficiency, though this will depend on further funding. In the meantime, the CGBC will study the impact of each individual component in HouseZero, from the smart windows to the added concrete, and release data about the costs and benefits. Though windows that automatically open and close seem straight out of a sci-fi movie, the hope is that homeowners will be able to install some of the elements of HouseZero in their own homes.